We are a leading Manufacturers & Exporters of Screw Conveyors such as Standard Screw Conveyor, Flexible Screw Conveyor (Shaftless) and Grain Augers of high quality. We have over 30 years of experience in design & manufacturing customized screw conveyor systems for various applications. Our ISO 9001:2008 systems certified workshop is fully equiped with fabrication equipments and is located in Noida (Delhi NCR). 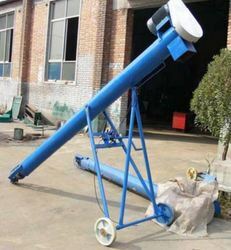 We manufacture precision high quality Screw Conveyor with U trough or tube. 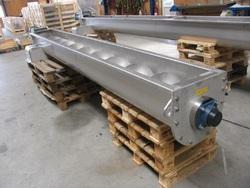 Our screw conveyors find wide application in carrying bulk materials. Cost effective solutions for conveying bulk materials. Contamination free conveying in closed environment. Can convey loads in horizontal or inclined positions. Well suited for controlled/measured discharge conditions. Cost effective conveying of bulk materials like aggregates, chemicals, cereal grains, boiler ash, wood chips, municipal solid waste and other semi - solid materials. Available in constructions of MS/SS. Packaging Details: As per shipping requirement. Our Grain Augers are simple and efficient Conveying Systems for grain handling. Efficient machines for filling of grains into containers/trucks/warehouses/Silos. High conveying and fill rates. Portable design for easy towability to any location. Option of inclination adjustment using mechanical screw arrangement or hydraulics. Simple and easy to maintain construction. Available in customizable options of auger length/ tube sizes/hoppers depending on required conveying capacity. Cost effective machines for saving labour, time and money in grain handling. Available in different constructions for height adjustment and towability. Packaging Details: As per shipping requirements.